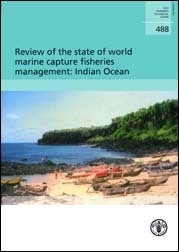 Review of the state of world marine capture fisheries management: Indian Ocean. Local fishing landing site. Ikoni, the Comoros. The views expressed in this publication are those of the authors and do not necessarily reflect the views of the Food and Agriculture Organization of the United Nations. The country reviews within this document are presented as received from the respective authors and have not been edited for content. Viale delle Terme di Caracalla, 00100 Rome, Italy. Review of the state of world marine capture fisheries management: Indian Ocean. FAO Fisheries Technical Paper. No. 488. Rome, FAO. 2006. 458p. During the first half of the 1990s, in response to the increasing concern about many of the worlds fisheries and following the United Nations Conference on Environment and Development (UNCED), a number of international fisheries instruments provided an impetus for countries to strengthen their fisheries management. A key step in supporting such efforts is the development of more detailed, systematic and comparable information on fisheries environments and management trends. The State of World Marine Capture Fisheries Management Questionnaire was developed by FAO in 2004 to help meet this need. The result have been grouped by region and reported in this publication. Today, we are able to look back to see how countries responded, to examine whether more fisheries are managed, and to determine whether the management tools and strategies employed have improved the overall situation in marine capture fisheries. Trends in legal and administrative frameworks, management regimes and status of marine capture fisheries are analysed for thirty-two countries in the Indian Ocean and presented as an easy-to-read and informative reference for policy decision-makers, fishery managers and stakeholders.